At the end of November, Russian Defense Minister Sergei Shoigu announced that Russia will supply Tajikistan with "large quantities" of military aircraft over the next year, indicating that China's growing influence in Tajikistan has not gone unnoticed in Moscow. As defense ministers of the Commonwealth of Independent States (CIS) gathered in the Russian capital for a regular meeting, Shoigu and his Tajik counterpart Sherali Mirzo signed a defense cooperation plan for 2017. "Next year, a key phase in defense cooperation, supplies of arms and military equipment will begin," the Russian Defense Minister said. "In particular, these are large quantities of aviation equipment, planes and helicopters. I think it will all be done in time. And, of course, will contribute to stability in the region." Shoigu also noted that Russia will continue to train military personnel for Tajikistan's armed forces, highlighting the threat posed by ISIS and other terrorist organizations in Afghanistan. Tajikistan's Defense Minister Mirzo took the same line, promising that "the southern borders of our Commonwealth will be securely guarded." According to an "official source" at the Tajik Ministry of Defense, Tajikistan will receive only new military equipment from Russia. "The forthcoming Russia’s armament supplies to Tajikistan will include a large number of aviation equipment, including combat aircraft, as well as armored vehicles and communication means," the source told Tajikistan's Asia-Plus news agency. 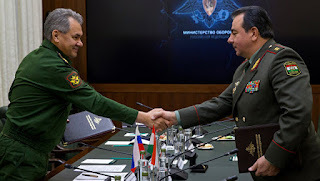 As the MoD source pointed out, Russia agreed to help modernize Tajikistan's armed forces when both sides signed a deal in 2012 to extend the lease of Russia's military base in the country for another 30 years until 2042. Shortly after the agreement was reached, reports emerged that Russia was planning to provide $200 million in military aid to Tajikistan. Dushanbe was not satisfied with this modest amount and demanded more aid before ratifying the base deal. In 2015, unnamed sources in Russia's General Staff told Russian media that the planned military aid to Tajikistan could reach $1.2 billion within the next few years. The sources said at the time that most of the aid would be second-hand equipment currently on the Russian forces' balance. If Tajikistan's MoD source is telling the truth, that is no longer the case and Tajikistan will be receiving new military aircraft, new armored vehicles and other new equipment. The most likely explanation for Moscow's generous mood are Russian concerns about China's growing influence in Tajikistan. As previously mentioned, China has been boosting its military ties with Tajikistan in recent months, further increasing its influence in the Central Asian country. This has not gone unnoticed in Moscow. Why else would Russia feel the need to strengthen Tajikistan's small air force with large numbers of - possibly new - military aircraft? There have been some clashes on the Tajik-Afghan border but the threat of a large-scale terrorist invasion is negligible. The Taliban just recently stated that they "have no problem with anyone on the Tajikistan border," denying Russian media reports about clashes between Taliban fighters and Tajik border guards. Instead the Taliban blamed the incident on a group of smugglers that "tried to move banned substances into Tajikistan border via Kunduz but were engaged by Tajik border troops." It seems that Moscow's generous mood has more to do with with Chinese competition than with threats coming from Afghanistan. The Taliban have welcomed Russia's growing role in the Afghan peace process but other actors take a dim view of Moscow's activities and the Russia-Taliban honeymoon. On December 2, U.S. General John Nicholson, the top U.S. commander in Afghanistan, told reporters at the Pentagon that Russia had joined Pakistan and Iran as external actors with a "malign influence" in Afghanistan. "Russia has overtly lent legitimacy to the Taliban," Nicholson said, accusing Moscow of creating the narrative "that the Taliban are the ones fighting ISIS, not the Afghan government." 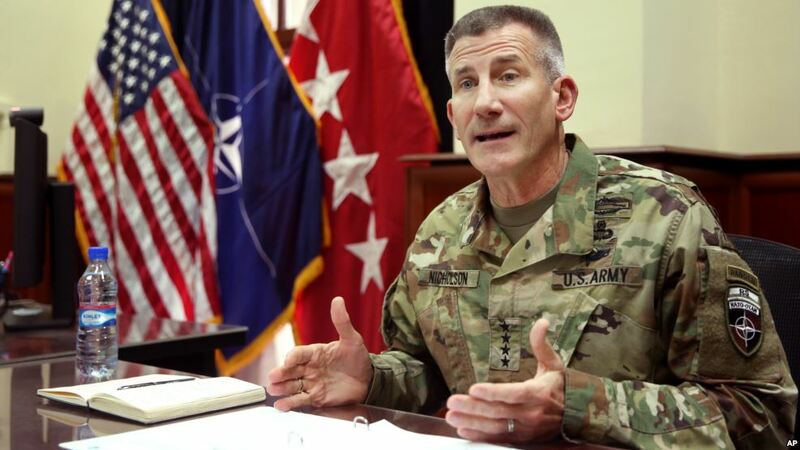 The general described Russia's behavior as "not helpful," adding that the United States "would like to see a change in their behavior in terms of not legitimizing the enemy." "From the Indian perspective, Gen. Nicholson’s revelations give an entirely new angle to the Russian-Pakistani ‘thaw’. It is inconceivable that Pakistan’s Inter-Services Intelligence was not in the loop about Russia’s dealings with Taliban. Quite possibly, ISI played the role of go-between. Indeed, the recent visit by Russia’s spy chief Alexander Bortnikov to Pakistan – first such visit in two decades – takes an altogether new coloring. It’s the Taliban, stupid – not CPEC!" As previously noted, Russia and Pakistan have recently teamed up with China to hold trilateral talks on Afghanistan. Both Pakistan and China are members of the Quadrilateral Coordination Group (QCG), but neither of them was invited to meetings between representatives of the Afghan government and the Taliban in Qatar, underlining the rift within the QCG. Attempts to drive a wedge between the Taliban movement and Islamabad have been remarkably successful. Russia's warming ties with Pakistan and the Taliban could be a complicating factor. A few days after Nicholson publicly criticized Russia, Reuters quoted an unnamed senior Afghan security official as saying that Russian support for the Taliban was a "dangerous new trend." Taliban officials insisted that Russian support did not extend beyond moral and political support. As the Reuters article noted, "Afghan officials did not produce evidence of direct Russian aid." The only evidence they could offer were recent cross-border flights by unidentified helicopters and seizures of new "Russian-made" guns. Russian officials and Taliban representatives have reportedly held several meetings in recent months. This alone was enough to raise concerns in Kabul and Washington. Afghan officials fear that Russia could be providing direct support to the group, including weapons or funding. Last week, Russia's Ambassador to Afghanistan, Alexander Mantytskiy, held a press conference and appeared before Afghanistan's upper house of parliament to address the concerns. Mantytskiy defended Moscow's outreach to the Taliban, arguing that Russia has common interests with the Taliban in the fight against ISIS. Russian officials have repeated this line over and over again, but Taliban officials just told Reuters that it had nothing to do with the fight against ISIS. One unnamed senior Taliban official was quoted as saying: "In early 2008, when Russia began supporting us, ISIS didn't exist anywhere in the world. Their sole purpose was to strengthen us against the U.S. and its allies." U.S. officials will need more than this quote if they want to blame Russia for the failure of the NATO-led mission in Afghanistan, which President Barack Obama all but admitted in his final major speech on counterterrorism as commander in chief. "You heard that (President Barack) Obama said America cannot defeat Taliban and that violations will continue in Afghanistan," Russian Ambassador Mantytskiy emphasized during his appearance before Afghanistan's upper house. "It means that America and the west has failed to complete their mission." As Moscow and Washington trade punches over Afghanistan, the U.S.-backed government in Kabul is facing its next major scandal, underlining that Russia's outreach to the Taliban is one of the smaller problems.